Guidance is compiled and interpreted by professional pilots and physicians at FlightPhysical.com from the 2014 AME Guide pages 53-65, FAA and FDA web data (www.FAA.gov & www.FDA.gov), instructions specified in the Aeronautical Information Manual, Federal Air Surgeon Bulletins from 1999-2015, and 14 CFR Part 61 and Part 67 (the FARs). For guidance regarding the conduction of visual acuity, field of vision, heterophoria, and color vision tests, please refer to Items 50-54. The Eye exam has many components and will be directed toward the discovery of diseases or defects that may cause a failure in visual function while flying or discomfort sufficient to interfere with safely performing airman duties. The AME should personally explore the applicant's history by asking questions concerning any changes in vision, unusual visual experiences (halos, scintillations, etc. ), sensitivity to light, injuries, surgery, or current use of medication. 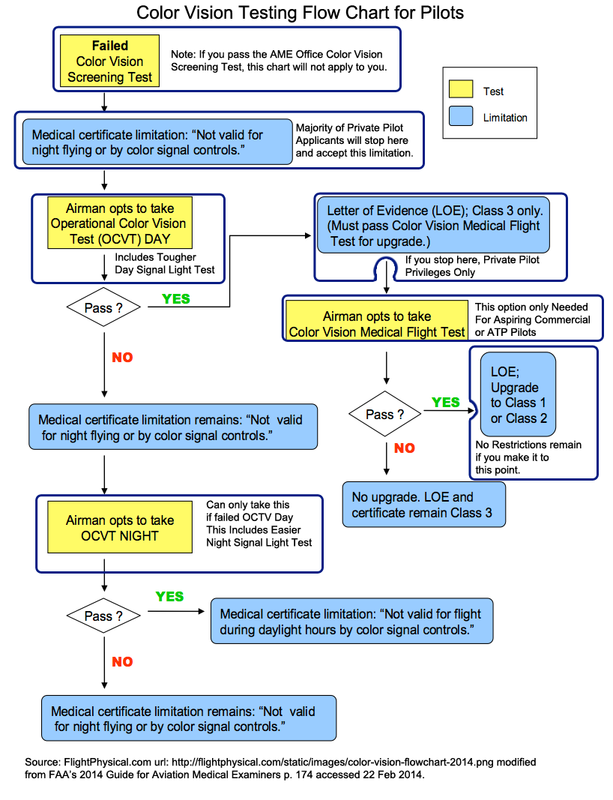 Does the pilot report inordinate difficulties with eye fatigue or strain? Is there a history of serious eye disease such as glaucoma or other disease commonly associated with secondary eye changes, such as diabetes? Color: redness or suffusion of allergy, drug use, glaucoma, infection, trauma, jaundice, ciliary flush of Iritis, and the green or brown Kayser-Fleischer Ring of Wilson's disease. Swelling: abscess, allergy, cyst, exophthalmos, myxedema, or tumor. Other External Eye Findings: clarity, discharge, dryness, ptosis, protosis, spasm (tic), tropion, or ulcer. This page discussed the General portion of the Eyes & Vision section of the Fight Physical Examination required of pilots.